After a twenty-year career in public service as a police officer and prosecutor, Kenneth is pleased to join the GoransonBain Ausley team. In his practice as a family lawyer, he welcomes the opportunity to help people in crisis, building on a longstanding commitment to serve others. Kenneth recognizes that no one wants to go through divorce, and he offers a keen understanding of the family dynamics involved. Approaching each situation as unique, Kenneth listens first, then tailors a personalized solution based on the best legal approach for the individual client’s needs. 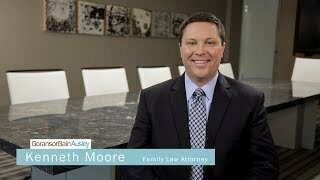 Kenneth draws on his extensive experience with family violence as a former detective to advise clients in dealing with child abuse, child custody, and domestic violence issues. In addition, he is trained in conflict resolution, working with high-conflict personalities, and dealing with the complexities associated with mental health disorders. Helping families as a whole and keeping children first are special interests of Kenneth’s. He is rewarded by seeing people overcome adversity, and being the helping hand that guides them to a new place in their lives. Before attending law school, Kenneth was a detective with the Terrell Police Department for 16 years, and was named 2008 Officer of the Year. Kenneth received his J.D. degree from Texas A&M University School of Law in 2016, and served as Assistant District Attorney in the Dallas County District Attorney’s Office prior to joining GoransonBain Ausley. Do I Have to Pay Child Support in a 50-50 Possession Agreement?